It may be just starting to cool down where you are, but in Finland it's already the beginning of autumn. The weather has a chill and the greenery has begun to disappear. It's time to put on a jumper when you head outside and the air has a crisp, fresh smell that harkens the changing color of the leaves. In Lapland, in the northern part of Finland, this time is known as ruska, or russeting. It's the time when the leaves change to vibrant reds and yellows and mark the turning of the season. It’s also time to start think about putting away the summer tablewear and making way for autumn. 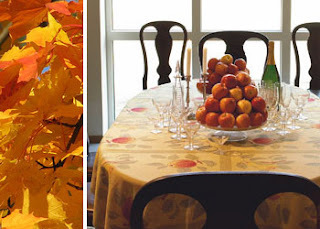 See Ekeland Weaver’s tablecloths, runners, napkins and placemats and tea towels in a beautiful autumn leaves pattern Cornell, Apples and Pears, and autumnal Pumpkin.